Fantasy of Flight is both a museum and an event venue, offering a variety of attractions and possibilities for visitors and event attendees. Dedicated to preserving and displaying historic aircrafts and their rich history, Fantasy of Flight is home to the largest private collection of aircrafts in the world. Self-described as “an attraction on a higher plane,” this one-of-a-kind event venue offers a unique event experience for those looking for something a bit different to wow attendees. Featuring an “Art Deco” inspired style, the event space is completely customizable, and can accommodate both indoor and outdoor events. On The Scene’s team of event professionals have experience producing one-of-a-kind event experiences at Fantasy of Flight. The versatile space is one of our favorite Orlando event venues, and our knowledge of the venue allows us to assist you in choosing the right space for your specific event. We will work as an extension of your team, learning your corporate culture, company goals, and brand to produce an event that is sure to make a lasting impression on attendees. Because it is so versatile and can accommodate a grand event or a more intimate affair, Fantasy of Flight is the ideal event venue for any type of corporate event you may be planning. Whether it’s a welcome reception for 1,000, or a team dinner for 50, Fantasy of Flight offers a unique atmosphere that is sure to impress attendees. 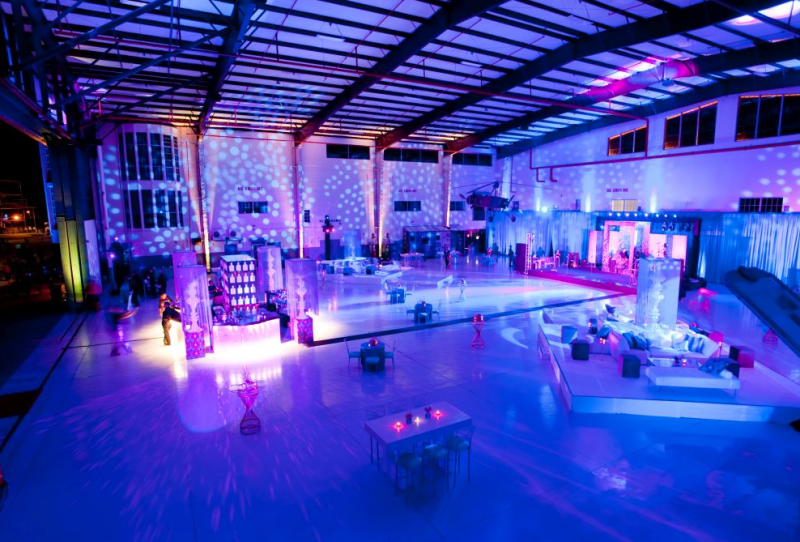 North Hangar (reception: 1,700; rounds: 1,080) – With 24,000 square feet of space and 44 foot ceilings, this open space is perfect for a large-scale event. It also features Fantasy of Flight’s collection of planes, which can be kept to add a more unique element, or removed for more space. South Hangar (reception: 1,800; rounds: 700) – Rented with the North Hangar, the South Hangar offers a more intimate space that is ideal for a cocktail hour or lounge area. Officers’ Club (reception: 200; rounds: 170) – A replica of a World War II Officer’s Club, this themed space comes complete with a tiki bar lights, a camouflage net ceiling, and other related decor. This space offers plenty of atmosphere and is perfect for an evening of fun and entertainment for a smaller group. Orlampa Conference Center (reception: 300; rounds: 220) – A more formal space complete with state-of-the-art AV equipment, this 45,000 square foot ballroom is ideal for meetings and is adjacent to the museum. 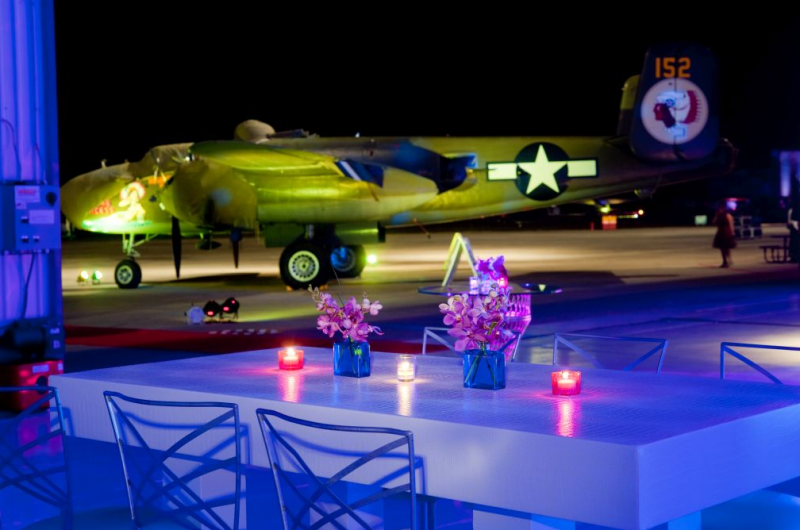 Carrier Deck (reception: 80; rounds: 50) – Adjacent to the North Hangar, this themed event space is perfect for more intimate gatherings, and features decor that recreates the “USS Yorktown,” complete with an observation tower that makes the ideal DJ booth. Compass Rose (reception: 150; rounds: 80) – Complete with a built-in bar, banquette seating, a staging area, and a registration desk, this vintage space exudes an old-fashioned charm and is perfect for a more elegant reception or intimate cocktail hour. The Lounge (reception: 150; rounds: 80) – With plenty of opportunities for custom branding, this space comes with a built-in display that makes adding a bar or buffet easy as can be. On The Scene is an award-winning Orlando event management company with years of experience producing innovative corporate events for clients in a variety of industries. We become your behind-the-scenes event partners, assisting with everything from initial planning and logistics to transportation, entertainment, and production. Interested in hosting your upcoming corporate dinner, welcome reception, or company meeting at Fantasy of Flight? Contact On The Scene today!